Not everyone uses keyboard shortcuts, and not everyone will find them any more useful than manual navigation. But it is always helpful to at least know what they are, and you might find yourself growing accustomed to using them. You may also be surprised to discover how useful they can really be. Not only does every program have these, but so do many websites. Each social media site has their own set of shortcuts, which can be found on their FAQ pages. Or, you can check them out here for the three main social media sites. You should start by knowing how to bring up a list of all the keywords. You don’t have to go searching for them. If you use the ? meta key, it will bring up a list of all of the other shortcuts, so you always have them on hand. It is a handy little way of providing it. Shift+Space Moves the page up. Space Moves the page down. Enter Closes a specified tweet. J/K Moves from one tweet to the next one without scrolling.
. Refresh the page or go back to the top of the page. / Takes you to the search box without scrolling. N Compose a new tweet. R Reply to a tweet. M Send a private message. G and P Go to your profile page. G and H Go to the home page. G and M Go to your message inbox. G and R Go to your notifications page. G and U View a user’s timeline through the search box. Unlike Twitter, Facebook bases their shortcuts (which are very basic) on the type of browser you are using. 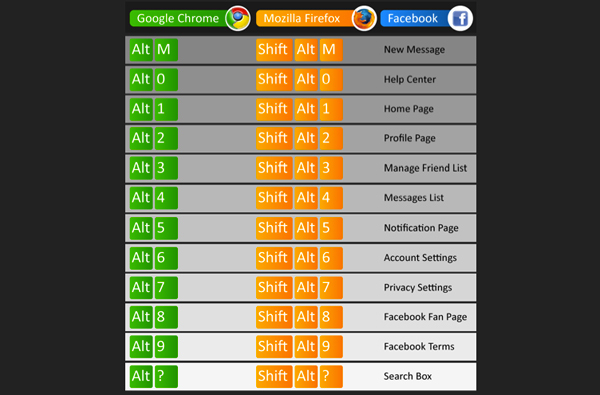 So Chrome users will have different main shortcuts than those using Firefox or Internet Explorer. But the map keys are the same for all of them, as are the basic navigation keys for your account rather than the main page. Alt+m Compose a new private message. Alt+1 Go back to the main page. Alt+2 Go to your Timeline. Alt+3 See all friend requests. Alt+4 See your message inbox. Alt+6 Go to your account settings. Alt+7 Go to your privacy settings. Alt+8 Go to Facebook’s profile page. Alt+9 See Facebook’s Terms and Agreements. Alt+0 Go to Facebook’s help center page. Google’s social networking site uses many of the same navigation shortcuts that their other services do. But they also sometimes change, so if something isn’t working, check their FAQ’s to see if it has been updated. k Go to the previous item in your stream. j Go to the next item in your stream. qq Search for people to chat with. As you can see, it isn’t that difficult to use these shortcuts, and not even to memorize them. So if you want to cut down on the time spent navigating different pages and just give it all a kind of flow, take some time to get used to these shortcuts. Great post, I actually had no idea about most of these, thanks! Me neither! Many of those were quite new to me! Most useful social media keyboard short cuts: http://t.co/iQpKsw7z Check em out! Really enjoyed trying some of these out! Learned some new tricks! Thank you! Glad to know they turned useful! 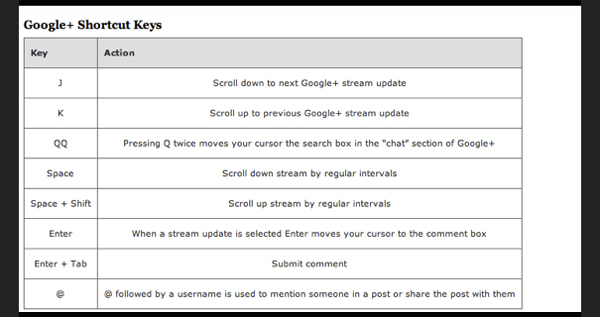 Most Useful Social Media Keyboard Shortcuts – http://t.co/WxJN7MtO by @seosmarty << handy! Using social media as part of my marketing strategy, I was pleasantly surprised to find these shortcuts. They’re incredibly helpful and save me a lot of time which in turn creates more time for other aspects of my business. Thank you so much.